The Nerf Blaster toy guns created by Hasbro have been a sensation since their first release in 1980. 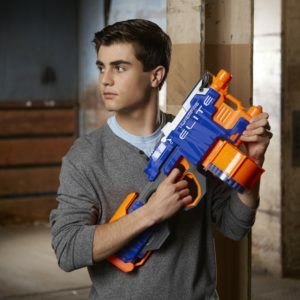 The recent addition to the series, the N-Strike Elite HyperFire Blaster, has received a huge positive response from Nerf gun enthusiasts all over the world. In the following sections, we shed light on its features and usability. The Hyperfire sports a futuristic design. In spite of having lots of sharp lines and edges like other Nerf Elite Blasters, it’s unusually large front portion and the single tactical rail on top make it look very special. The four D batteries used by the Hyperfire are placed in the rear which helps in balancing the weight from the bulky front part. Although some people would be put off by the device’s unnecessarily large size, most of them will think otherwise when they actually use it. The round piece at the bottom, which serves as a grip point, does a great job, but we would have preferred if it were much higher, just under the muzzle. The thumbhole design looks nice, and the cheek rest perfectly sits in place. The handle is fairly comfortable but the handguard may feel a little squishy if your fingers are too large. The Hyperfire can be operated just like any other flywheeler. First, you press the rev trigger to spin up the flywheels, and then, you pull the trigger to fire. However, due to the absence of cycle control, the time gap between the trigger pull and the firing of the first dart varies. The Hyperfire has an exceptional range. This point makes this considered the best nerf gun ever in the world! When the flywheels are spinning at full speed, a single shot can reach up to 10 meters. The range decreases to 5-6 meters when you fire rapidly. The Rate of Fire (ROF) is Hyperfire’s selling point. With new batteries, you can fire up to 5-6 darts every second, but unfortunately, this claim is valid only when you use perfect darts in a perfect drum or magazine. Due to the conveyor belt design, the darts should be round and plump, and must be placed at the top most part of the mag. If these conditions aren’t met, the darts won’t feed properly resulting in a drop in performance. Thanks to its good range and ROF, the Hyperfire serves as a decent suppression and area saturation blaster. Its 25-dart drum makes it very easy to fire rapid bursts of Nerf darts towards an area, but you may fire a lot of angled shots. The Nerf N-Strike Elite HyperFire Blaster Review would be incomplete without mentioning how well this Nerf gun can be customized. Like all flywheelers, the Hyperfire is highly modifiable as you may improve its range and ROF by a huge extent using a standard rewire, reswitch, and a battery pack. Overall, the Nerf N-Strike Elite HyperFire Blaster is an excellent toy gun packed with exciting features. It shoots darts with enough accuracy and speed to take on any opponent in a Nerf war. Click here to buy this product on Amazon.com. Great Design, very futuristic and ergonomic! The rate of Fire is the selling point why you should get this Nerf!